Acknowledgements: The name “Bake” is thanks to Andy Adams-Moran. 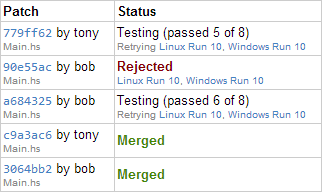 Patches are submitted to Bake, but are not applied to the main repo until they have passed all their tests. There is no way for someone to “break the build” - at all points the repo will build on all platforms and all tests will pass. Now we have defined the example, we need to start up some servers and clients using the command line for our tool. Assuming we compiled as bake, we can write bake server and bake client (we’ll need to launch at least one client per OS). We can view the state by visiting http://127.0.0.1:5000 in a web browser.